We all love skiing but the damage that is done to the environment in building down hill slopes is horrendous! For those of you who care about our planet but still love the idea of being out in the snow there are alternatives! You can still go skiing without creating such a massive impact on our precious alpine habitats. How can you do this I hear you ask? The answer is simple! Give cross country skiing a go! You do not have to be super fit or even a particularly good skier to enjoy this sport. Also it doesn't damage your pocket as much as downhill. All you need is a bit of an introduction and within a morning you can be off exploring natural parks, or trying your skills on an Olympic circuit. There are no crowds, no queues at the lifts (No lifts!) and you can take all day! Wild animals, frozen waterfalls, fabulous mountain scenery is all yours. 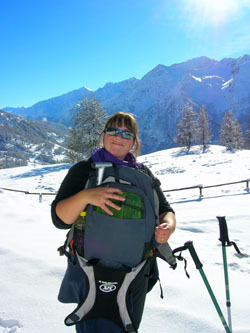 If you do not like the idea of skiing at all then why not try a snow shoe trek? 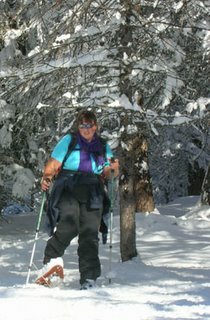 This is a great way to enjoy the magical winter landscape and is as simple to learn as walking. Where can I do these activities? Spooky you should ask that! It just happens that we can organise a short break or a week-long holiday that can introduce you to both of these activities . We can even throw in some down hill if that is what you want. Just take a look at the packages on our website http://www.belvederebedandbreakfast.com to find out more. 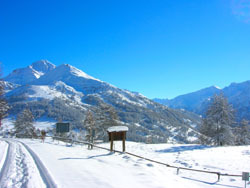 Try something new and discover a whole new world of winter activity!